Height Range with MLS100: 31.9 to 68.8"
Get a tripod system that stands up to the demands of ENG and EFP production with the 100CF2 100mm Carbon Fiber Tripod & Agile 12S Fluid Head System with S-Loc camera interface from OZEN. Comprising a 100CF2 two-stage carbon fiber tripod and an Agile 12S fluid head, this system works with 4.4 to 30.8 lb payloads. It offers 10-step counterbalance, 5/5 + 0 pan/tilt fluid drag, and working heights ranging from 31.9 to 68.8" using the included, removable MLS100 mid-level spreader. If you need to go even further up or down, you can replace the included spreader with the separately available Contender heavy-duty mid-level spreader, which gives you a range of 29.9 to 71.3". The tripod is equipped with deep-tread rubber feet and comes with a SoftCase 100, which has a carry strap and an internal pouch for storing the included pan bar. 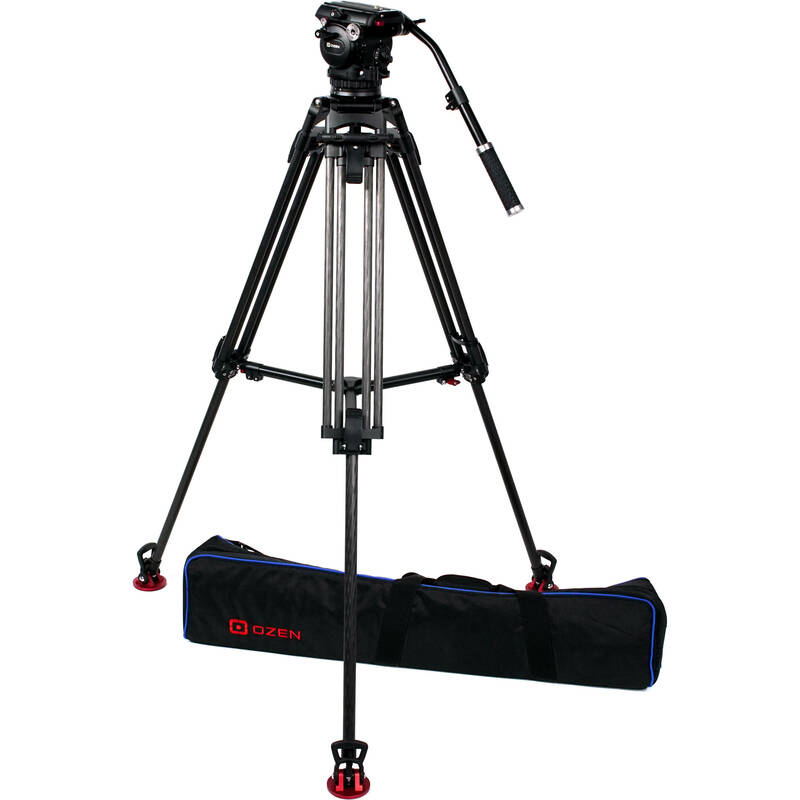 Give your camera solid feet to stand on with the 100CF2 100mm Carbon Fiber Tripod from OZEN. Designed for use with a separately available 100mm fluid head, this lightweight two-stage tripod supports a payload of 55 pounds and offers working heights ranging from 25.6 to 62.5" using the included, removable mid-level spreader. If you need to go even further up or down, you can replace the included spreader with the separately available Contender heavy-duty mid-level spreader, which gives you a range of 23.6 to 65". For greater rigidity, the 100CF2's molded carbon fiber leg tubes are pin-secured to their anchors—no glued joints. Highly visible twist-lock brakes are used to secure the legs into place. Moreover, the 100CF2 comes equipped with deep-tread rubber feet for better traction on smooth surfaces. Smooth your pans and tilts with the Agile 12S Fluid Head from OZEN. Designed for fast setup in ENG- and EFP-style shooting scenarios, the Agile 12S is equipped with a CNC-machined dial mechanism for crisp, repeatable counterbalance adjustment in 10 steps. The Agile 12S's versatile design enables you to quickly change camcorder configurations within a payload range of 4.4 to 30.8 pounds. The Agile 12S is equipped with a 5/5 + 0 fluid drag mechanism and offers a tilt range of 90 to -80°. The considerable amount of fluid drag available at higher increments enables experienced operators to acquire full-zoom, pan/tilt-intensive images that are indistinguishable from those acquired in close. This fluid head uses the S-Loc camera mounting interface, which enhances the front-to-rear balance adjustment range to accommodate exceptionally front- or back-heavy camera setups. The OZEN Soft Case is a replacement case for heavy-duty 75mm and 100mm systems. This is the case typically included with 75AL2HD, 75CF2HD, 100AL2, and 100CF2 tripod systems. The case has an internal pouch for storing a pan bar and carry strap.